Having grown up near the shore, I’ve a great affinity for the small unsung museums that serve as the repositories for coastal lore and culture. Much like the beach in January, such places – like the Barnegat Light Historical Society and Museum, at the north end of Long Beach Island, New Jersey, which in a former one-room schoolhouse contains, among other artifacts, the original first-order Fresnel lens from nearby Barnegat Lighthouse – tend to draw those who most appreciate a place for what it is in and of itself. 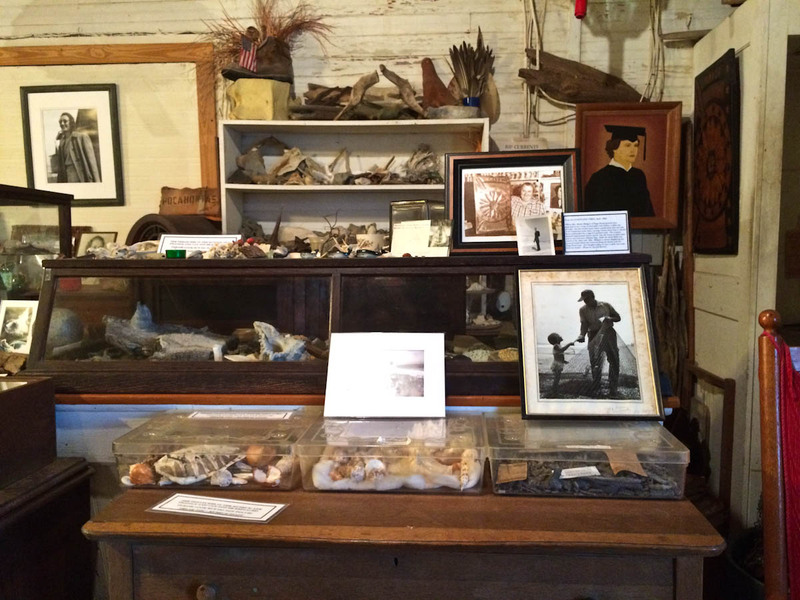 While other attractions superbly highlight the area’s past within a greater historical context (e.g., the Wright Brothers National Memorial or the Lost Colony of Roanoke Island), the Outer Banks Beachcomber Museum in Nags Head provides a glimpse into the daily lives of the hardy souls who inhabited these parts long before mini-golf and timeshares. When a Google search prior to our trip turned up the Beachcomber Museum, I was thrilled to have found such a hitherto unexplored nook. My jubilation, however, was quickly tempered by the chilly realization that, like many beachfront concerns, the Museum would most likely be closed in mid-January. 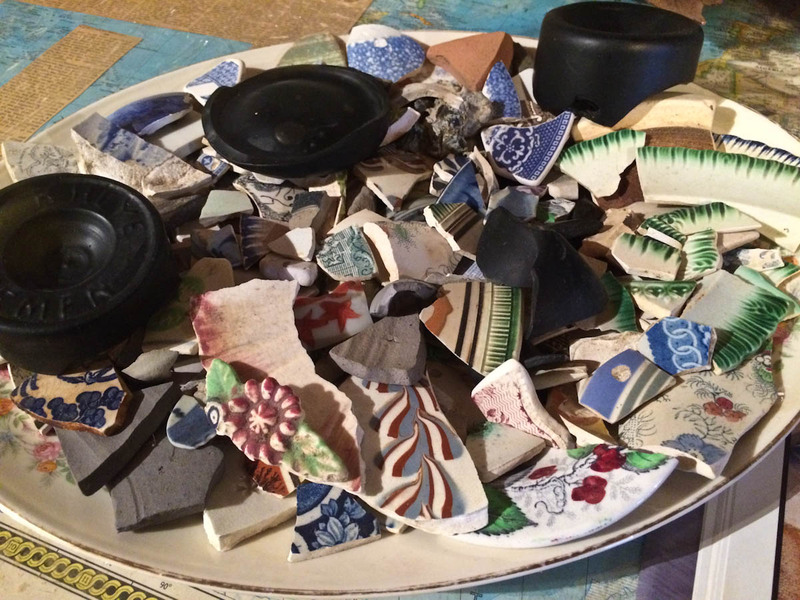 Nevertheless, Davida, taking a shot in the dark, sent an email to the address on their website – and soon received a reply from the Museum’s proprietors, Chaz and Dorothy. They arranged a time for us to visit the museum during our trip. We were especially lucky because the museum does close for the winter, but they kept it open and heated the space just for our visit. 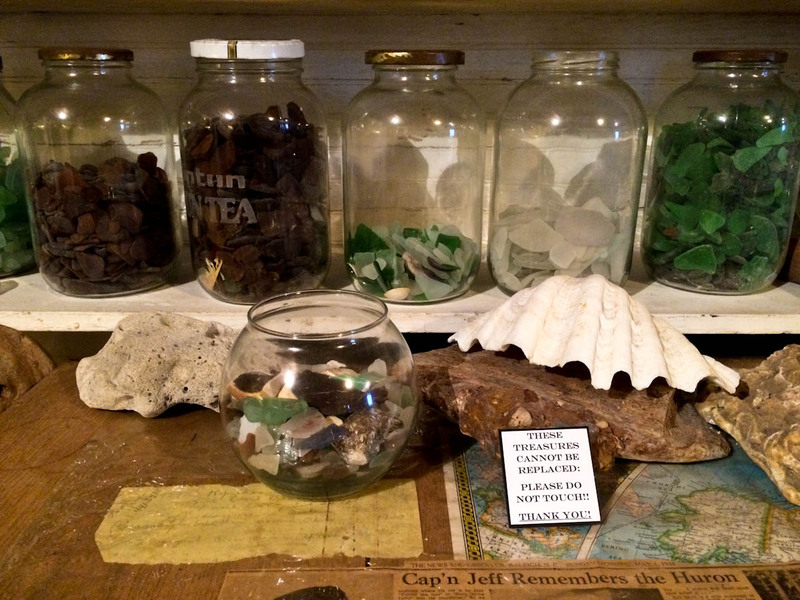 A cold rain fell as we drove down the beach road (NC Route 12), past shuttered summer homes left alone to face the wintry seas, to Mattie Midgette’s 1914 general store, which now holds the late Nellie Myrtle Pridgen’s collection of washed-up ephemera collected from the surrounding coastline over the course of the Outer Banks native’s 74-year lifetime. Chaz and Dorothy warmly welcomed us. 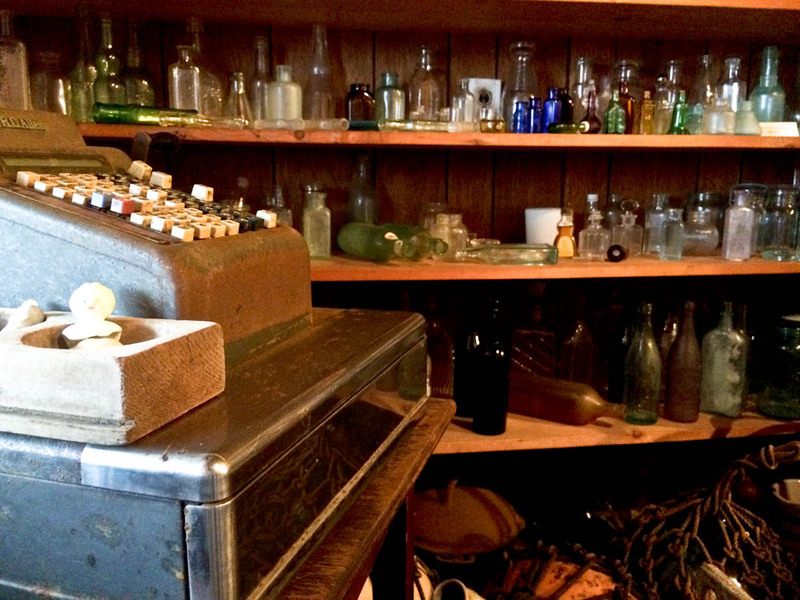 Following brief introductions, Dorothy, herself a cache of historical knowledge and local goings-on, took us on a tour of what in my experience is a most singular collection, the only one of its kind that I have ever seen, anywhere. 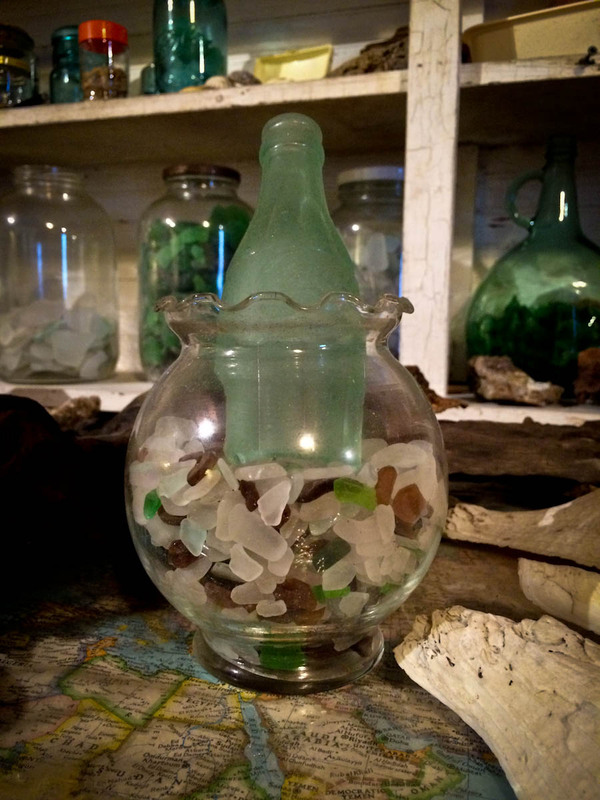 Here, for example, you will find an expansive array of shells, sea glass, photographs, bottles (some dating back to the 1600s), Japanese glass fishing net floats, Trinidadian relics, and notes found in bottles, as well as several examples of fulgurites, the product of a lightning strike upon sand. One of my favorite items was an elaborately embossed Guinness bottle from 1959 – part of an ingenious “message in a bottle” advertising campaign celebrating the brand’s bicentenary, wherein 150,000 of the special bottles were dropped into the Atlantic Ocean. Each one contained a memo “From the Office of King Neptune” that invited the finder to inform Guinness as to when and where they made the find. Chaz, it turned out, is also a photographer, and though we paid no admission fee, we did purchase two of his prints, which help to support the Museum. 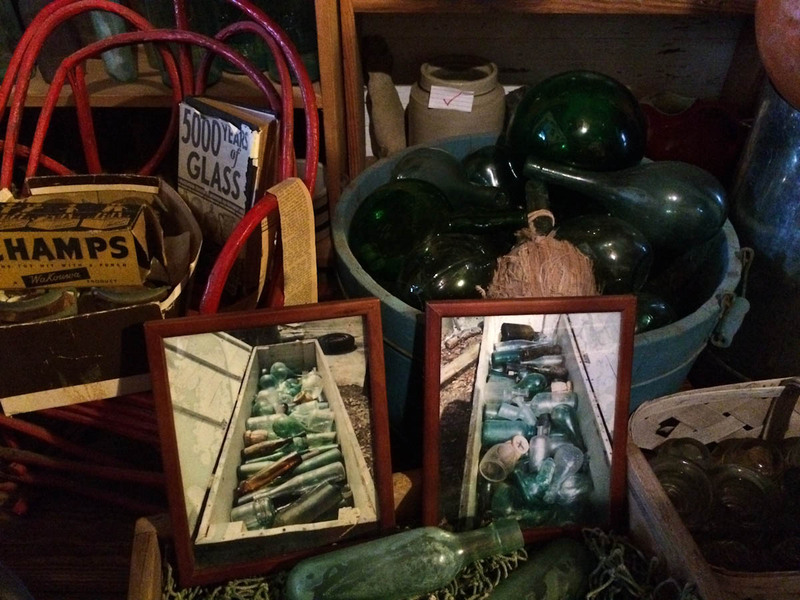 I commend Dorothy and Chaz’s efforts to preserve a collection unlike any I have ever seen. This place is a must-see for Banks visitors new and old, and a fascinating glimpse into the lifelong obsession of one of the beach’s more vocal keepers and defenders. Very accomodating people, to open up the place just for you.